Among them is the new Ikegami UHK-430 and UHK-435 portable and hard studio 4K UHD camera cameras from the company’s Unicam XE camera series. The UHK-430 and UHK-435 cameras provide full 4K image capture. They feature three 2/3-inch 4K (3840x2160) CMOS sensors with RGB prism optics, for “Real 4K” resolution from 24 million pixels (8 million per sensor). At the NAB Show Ikegami will also debut its optional MoIP interface for the CCU-430.This rear plug-in module provides 25G or dual 10G IP interface together with a pair of 12G, 3G, or 1.5G SDI outputs. Ikegami’s HDK-99 3G-capable digital 3-CMOS HDTV portable camera will be exhibited, representing the top of the line offering from the company’s Unicam HD series. It employs three 2.6 Megapixel high performance CMOS image sensors capable of capturing full HD (1920 x 1080) resolution. Along with a wide dynamic range of more than 600%, the HDK-99 captures HD video with its horizontal resolution of 1000TVL, SNR of 62dB or more, and high sensitivity of F11 (59.94Hz). HLG (Hybrid Log Gamma) mode is featured on the HDK-99, conforming to the ITU-R BT.2100 International standard for HDR. HLG makes it possible to expand the range represented from dark to bright, providing superb bright pictures with High Dynamic Range, while achieving rich colors with wide color gamut. As a multi-format camera, the HDK-99’s CMOS sensors support progressive and interlace readout. It also natively supports 1080i /59.94, 1080i/50, 720p/59.94, 720p/50, 1080p/29.97, 1080p/25 and 1080p/23.98. It also supports 1080p/59.94, 1080p/50, 1080i/119.88, and 1080i/100 3G HDTV formats. The UHK-430 and UHK-435 camera provides full 4K image capture via three 2/3-inch 4K (3840x2160) CMOS sensors. 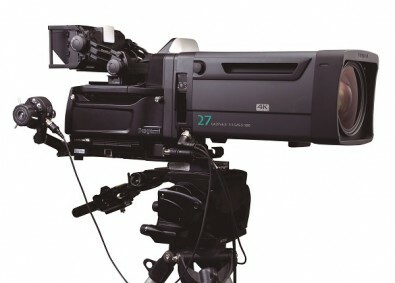 From Ikegami’s Unicam HD camera series, the HDK-73 camera will be exhibited with its F12 high sensitivity 2/3-inch CMOS sensors that provide exceptional picture quality in either 1080i or 720p resolutions.The HDK-73 has docking style construction allowing studio configuration with fiber or triax base stations, as well as self-contained operation for wireless or onsite recording applications.Fiber configurations include a choice of SMPTE or OpticalCon connectors. The company will also be introducing virtual control capabilities for its new and existing camera lines. The Virtual Control Panel (VCP) is a software-based PC application providing operational control of multiple cameras. Ikegami’s Virtual Master Panel (VMP) is another newly available application that enables centralized management of all cameras within the camera control network. Ikegami's full HD HLM 60 Series of monitors will be shown with a new HDR option. The HLM-2460W 24-inch HDTV/SDTV full HD pixel multi-format LCD color monitor has a 24-inch full HD 1920X1080 pixel 400cd, 10-bit resolution LCD panel. Offering very narrow front-to-back dimensions, light weight and low power consumption, the HLM-2460W provides SDI, 3G-SDI, HDMI, and analog composite inputs as standard. By employing a full 1920x1080 pixel LCD panel with a wide viewing angle, high brightness, high contrast, fast motion response, and high-quality color reproduction, it achieves real pixel allocation without resizing. 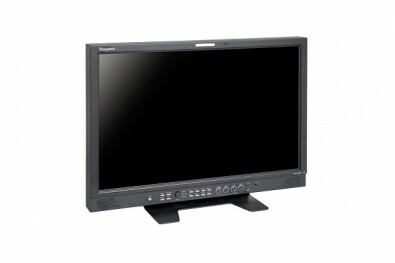 The HLM-2460W 24-inch HDTV/SDTV full HD pixel multi-format LCD color monitor has a 24-inch full HD 1920X1080 pixel 400cd, 10-bit resolution LCD panel. The HLM-2460W will be joined by the HLM-1760WR 17-inch HDTV/SDTV full HD pixel multi-format LCD color monitor and the HLM-960WR nine-inch HDTV/SDTV full HD pixel multi-format LCD color monitor. Ikegami will demonstrate its HQLM series with advanced HDR capabilities, complying with HLG and PQ (SMPTE ST 2084), among other standards. They include the Ikegami HQLM-3120W 31-inch 4K/HD multi-format LCD monitor equipped with two channels of 12G-SDI input as standard, for efficient configuration with 4K equipment such as cameras and switchers. In addition, it includes 3G-SDI, HD-SDI and HDMI inputs as standard, with the flexibility to work with various interfaces in the image production field. Ikegami’s HQLM-3125X 31-inch 4K/HD multi-format LCD master monitor is also part of the series, employing a direct backlit 4096 x 2160 pixel 10-bit resolution UHD LCD panel with a contrast ratio of 1,000,000:1. The Ikegami HQLM-1720WR 17-inch 4K/HD multi-format LCD monitor is equipped with the same complement of inputs as the other 4K models in a compact rack mount size. For an 8K experience, Ikegami’s SHK-810 8K ultra high-definition television (UHDTV) camera will be at NAB. Developed in collaboration with Japan Broadcast Corporation (NHK), the SHK-810 is a breakthrough camera notable for the significant size reduction and lightweight design that it brings to field and live production, operating with the same ease as current broadcast cameras. The SHK-810 employs a 33 million pixel Super 35mm CMOS sensor with PL lens mount, achieving a limiting horizontal resolution of 4000 TV lines.This portable camera utilizes standard SMPTE hybrid camera cable between head and CCU with available portable and studio viewfinders.